Cerny made a very early start in games. At 1982, at the age 17, he left his studies in math and physics at the University of California at Berkeley to become a programmer and game designer for Atari Games. There he created Marble Madness, an early arcade classic still remembered for its Escher-esque graphics and physics based gameplay. In 1985 Cerny joined Sega, relocating to Sega’s Tokyo offices and making a transition from arcade games to cartridge based games for home systems. At the time, he spoke no Japanese, but quickly became proficient speaking and reading the language. In addition to creating conventional games such as Shooting Gallery for the Sega Master System, he also worked in the extreme high-tech end of the 1980’s console business, setting up a line of 3-D games using active shutter glasses, as well as an online games network – both projects years or decades ahead of their time. After three years in Tokyo he returned to the US, where he founded and managed the Sega Technical Institute and oversaw the development of Sonic the Hedgehog 2. In 1994 Cerny joined Universal Studios to set up product development at their interactive group, working first as VP and later as President. Shifting to a producer role, Mark managed the design and development of the Crash Bandicoot and Spyro the Dragon series for PlayStation, in particular focusing on enhancing the appeal of the games for the Japanese market. The games were blockbuster hits, selling over 30 million units internationally; in Japan, the Crash Bandicoot series ended up becoming the most successful character-based foreign developed video game of all time, a distinction that it still holds today. In 1998, Cerny founded Cerny Games as a consultancy, initially working on behalf of Universal Studios on the game design of subsequent Spyro the Dragon and Crash Bandicoot titles. Mark then worked directly with Insomniac and Naughty Dog on their debut titles for the PlayStation 2, as an engine programmer for Jak & Daxter: The Precursor Legacy and as a game designer for Ratchet & Clank. At the inaugural D.I.C.E Summit in 2002, Cerny first spoke in public on his unique production methodology, which he calls Method. “Mark’s thinking on how best to create games has been truly influential,” states Bruce Shelley, 2009 inductee into the AIAS Hall of Fame. 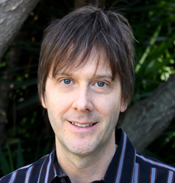 “The Cerny Method, with its emphasis on creative freedom and risk taking, has really informed the debate on the proper role of preproduction in video game development.”In recent years, Mark has continued to work as an independent, contributing in various ways to Resistance: Fall of Man, Ratchet & Clank Future: Tools of Destruction, Resistance II, Uncharted: Drake’s Fortune, and God of War III, as well as a number of technology initiatives at Sony Computer Entertainment. Cerny lives in Los Angeles with his wife of 20 years, and two cocker spaniels. He is a huge fan of Japanese television and from childhood has been an avid bookworm, activities that he pursues when he is not creating or playing games.